Focusing on business support and training we’re breaking our Open Day into two segments; a free drop-in business advice surgery and a Networking Masterclass workshop. If you need advice on how to start, grow or improve your business, our advice clinic is the place for you! From 10-12pm we’ll bring together all the people you need to see in one room. Our exhibitors can help you wherever you are on your business journey. 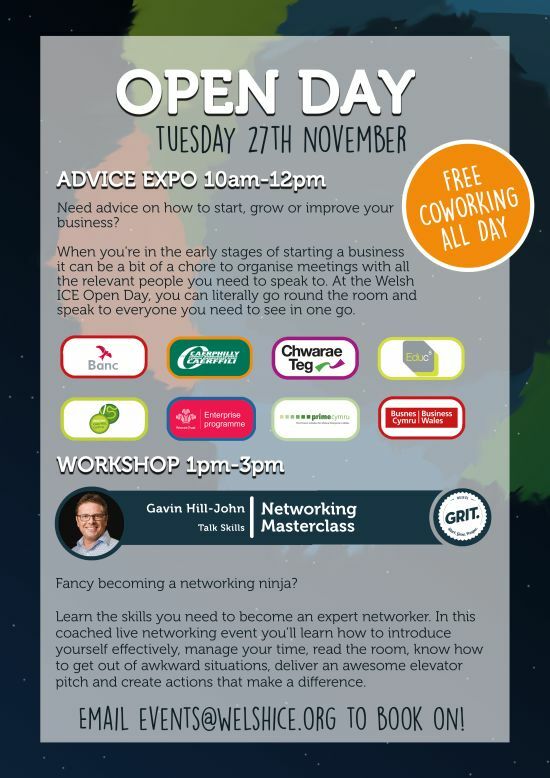 Fancy becoming a networking ninja? Learn the skills you need to become an expert networker. In this coached live networking event you’ll learn how to introduce yourself effectively, manage your time, read the room, know how to get out of awkward situations, deliver an awesome elevator pitch and create actions that make a difference. Limited spaces available. Book on by emailing events@welshice.org.